The Swedish Vallhund dates back to 8th Century Sweden where the breed was utilised as farm dogs, primarily for herding cattle. The Swedish Vallhund is known in its native land as Vastgotaspets, which means Spitz of the West Goths. This dog is also known as the Swedish Shepherd. In Sweden it is believed the Vallhund travelled to Wales with the Viking raiders and went on to become the ancestor of the Pembroke Welsh Corgi. Swedish Vallhunds can live up to 15 years of age. The Swedish Vallhund is a chirpy little working dog, in which the herding instinct is still very evident. An energetic breed, the Vallhund is friendly, active, agile and very intelligent. It responds well to training due to its eager-to-please personality and is very trustworthy with children. These dogs do well at obedience, love agility and are accomplished trackers. The Swedish Vallhund is quite trustworthy with other dogs. Vallhunds are tough, hardy dogs, not subject to any particular ailment. When properly cared for, they are seldom ill. Their low maintenance coat is weather resistant and easily repels mud and grime. They have a major moult at least once a year, shedding their woolly undercoat everywhere - however, daily grooming during this period will ease the problem. Regular grooming throughout the year is recommended to keep the coat shiny and remove any dead hair. Mental stimulation and regular exercise are also important, as a bored Vallhund can create havoc in its yard or flat. The Vallhund is very much a working breed and when excited has been known to nip the heels of its owners. These dogs tend to like the sound of their own voice and may require training to stop them from barking. 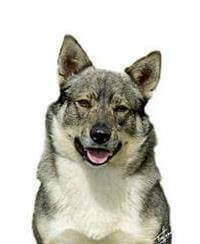 An ideal family pet, the Swedish Vallhund is suitable for children and for the active elderly.